When the days are short and the nights are long there is only one thing for it- soup! A big pot of soup simmering away is the perfect answer to the dilemma of what to take to work for lunch in the week but is also great for a dinner if you want to make meals ahead for the coming week. This curried root vegetable soup is a classic which makes the most of seasonal vegetables whilst warming it with a little spice which complements the sweetness and earthiness of the roots. When prepping the vegetables try and make sure the chunks of carrot and parsnip are the same size but keep the swede a little smaller as it takes longer to cook. To keep things quick you can use a premade curry powder blend or make your own with a balance of ground cumin, coriander, turmeric, ginger and chilli so you can make it to suit your tastes. No soup is complete without a topping and this is no exception! Parsnip crisps are ideal for this and can be made by peeling an extra parsnip and ribboning using a peeler. Toss with oil and season. Place on a baking tray and bake at 160c/ 140 fan until crisp and golden. Start by heating a glug of oil in a large pan that will be big enough to fit the soup in. Gently cook the onion for a few minutes before adding the garlic and continuing to cook until both and softened. Add in the root vegetables and stir to combine with the onion. Cover the pan and allow to sweat for 10-15 minutes. Next up goes the hot stock and simmer for a few more minutes. Use a stick blender and blitz the vegetables until thick and creamy. Add in the milk, curry powder and season well to taste. Blend a little more if you like to you achieve a consistency you like; you can also add more stock or milk if you need. Serve in warmed soup bowls with crusty fresh bread and top with parsnip crisps. Curried root vegetable soup- the perfect antidote to blustery autumn days! I have never come across a prawn recipe that I have not loved and this is no exception! Salt and pepper prawns are the ultimate savoury dish which can be cooked to take centre stage or be served as part of a Chinese feast. Shell on king prawns are used in this recipe to protect the sweet prawn from the heat when they are cooked. I have trimmed the prawns, deveined them and removed the head for ease but you can keep them whole if you like. 1. Start by rolling the prawns in the corn flour. In a small pan, dry fry the peppercorns and salt together; the salt should start to look a little grey when it is ready but be careful not to burn it so agitate the pan from time to time. Grind the mixture in a pestle and mortar. You are after a rough texture rather than a peppercorn powder! 2. Use a wok and pour in oil so you can shallow fry the prawns. Pop the prawns in for around 2 minutes until the prawns are cooked and pink. Remove from the pan with a slotted spoon and blot onto kitchen towel before sprinkling with the salt and pepper mixture. Serve immediately with a chilli dipping sauce if you like. A finger bowl of water is also a good idea! Salt and pepper prawns- you can never have just one! There is no better way to warm yourself up on a chilly day than a big bowl of soup. This uses a spice combination that lends itself to a smoky, gently spiced finish that will satisfy everyone. Of course you can ramp up the heat by adding extra cayenne pepper or chilli if you want a full on kick! I have used a mix of cascabel and chipotle morita chillies which add heat as well as smokiness and nuttiness. You could also add a roasted red pepper for an added dimension. If you want to keep the soup vegetarian then simply omit the chorizo and serve with a drizzle of sour cream and a hunk of crusty bread on the side or a few tortilla chips to dunk or crush up on top like croutons. Some freshly chopped coriander also goes well here. 1. Take a heavy based large saucepan and heat the oil over a medium heat. Soften the garlic and onion in the pan before adding all the spices. Cook for a couple of minutes before squeezing in the tomato puree and adding the oregano which also need to be cooked out for a couple of minutes. 2. Pop in the tomatoes, beans and stock. Bring to the boil and then reduce the heat to a simmer for 20- 25 minutes. I add the whole chilli at this stage to infuse. If you want a bit more heat you can chop the chilli into the soup. When ready, take the soup off the heat, season and allow to cool slightly. The soup now needs blending either in a large blender or using a hand blender if you prefer. Blitz and then taste again to check the seasoning. As the soup is finishing off, take chorizo and cut into small pieces. Dry fry in a frying pan until crisp. Serve the soup in warmed bowls and sprinkle the crispy chorizo on top. Smoky and spicy bean soup- a perfect warmer with a taste of Mexico! After cooking a roast dinner the other day I had a lot of leftover chicken that was calling out to be finished up and this is where this simple but spicy Szechuan shredded chicken comes in. Szechuan pepper is a wonderful ingredient that is well worth using if are not familiar with it and have not cooked with it. It brings a warmth along with citrus notes that really lift a dish. I also served this with homemade spring rolls and salt and pepper prawns for a midweek feast. As I say I used leftover roasted chicken for this however you can roast chicken thighs or legs in advance if you don’t have any spare; avoid breast meat if you can as it tends to dry out quickly. I have purposefully left the chicken quantities more vague than usual- I often struggle to eat much meat in a meal however when it came to this I couldn’t help but have seconds…and thirds… Just remember that leftover beef would also work a treat! Cashews are also a welcome addition if you like too. 1. Start by heating the oil in a wok to medium. Shred the chicken into pieces and toss in the cornflour. Begin to fry off in the oil and stir from time to time. You want chicken which is golden and starting to crisp up in places. When just crisping up, add in the chopped pepper and cashews; stir well. 2. In the meantime, combine all the remaining ingredients in a bowl. Choose a small pan and simmer the sauce until thickening and glossy. Tip into the chicken and toss to coat. Serve immediately with rice or noodles. Spicy Szechuan shredded chicken- love your leftovers with this super speedy midweek meal! 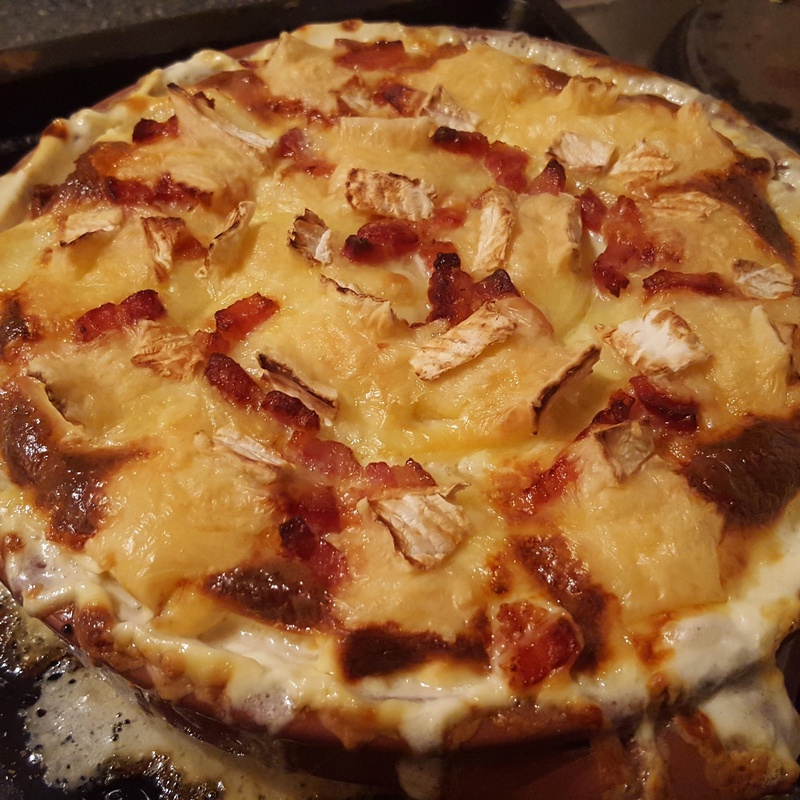 Tartiflette is a comforting French dish popular amongst those heading to Alpine resorts. Just picture the scene, coming back in from a day on the slopes and in need of a comforting dish to warm you up whilst sipping a glass of wine or two in front of a roaring log fire- heaven! If you like potato, cheese and bacon then this is the perfect dish for you! In my version I have added cavolo nero as a nod towards one of your five a day but you could leave it out if you prefer or replace with spinach if you like. 1. Firstly preheat the oven to 200c/ 180 fan. Take a frying pan and heat over a medium heat; fry off the lardons until golden, remove from the pan and set aside. Keep an bacon fat which is in the pan. Shred that leaves of the cavolo nero and fry in the pan along with the garlic and shallot until wilted. Remove and set aside. 2. Rub a little softened butter in the inside of a baking dish approximately 20cm x 25cm in size. I sometimes use individual baking dishes so everyone has their own so it’s up to you. 3. Cut the potatoes into 3mm thin slices and layer in the dish with the cavolo nero, bacon and half of the cheese. Leave the thinnest potato slices for the top so they go crispy when it’s cooked. Season the layers as you go. 4. Pour over the cream and stock and top with the remaining cheese. Bake for 45 minutes to 1 hour until golden and bubbling. Allow to stand for few minutes before digging in.